This easy oven-fried zucchini is a delicious way to enjoy a bumper crop. Zucchini is sliced into rounds, breaded in a Parmesan-breadcrumb coating, and "fried" in the oven for less of a stovetop mess and a lighter calorie load. This no-fuss veggie is a great side dish with everything from chicken to fish to burgers, or a terrific appetizer as is or with ranch or another dip of your choosing. Drizzle 1 tablespoon of the olive oil over a baking sheet to evenly coat. Set aside. Wash, trim, and slice zucchini into 1/2-inch thick rounds. Beat egg in a small bowl. Spread breadcrumbs out in a shallow dish. Stir Parmesan cheese, salt, basil, and pepper into breadcrumbs. Dip 5 to 6 zucchini slices into the beaten egg. Transfer to the breadcrumb mixture, pressing on both sides to coat. Shake off excess and place on prepared baking sheet. Repeat with remaining zucchini slices. Drizzle remaining 1 tablespoon of olive oil over the zucchini. Bake in heated oven 8 minutes. Using tongs, turn zucchini so the other side gets crispy. Bake another 5 to 7 minutes until golden brown. Allow to cool on pan 2 minutes and then serve hot as a side dish or appetizer. To keep oven-fried zucchini warm if serving them as an appetizer, set the oven to 200F. Place a cooling rack over a baking sheet to catch drips and place zucchini rounds on it. By doing this, you elevate them from contact with the pan and they won't become soggy and should retain their crispness. 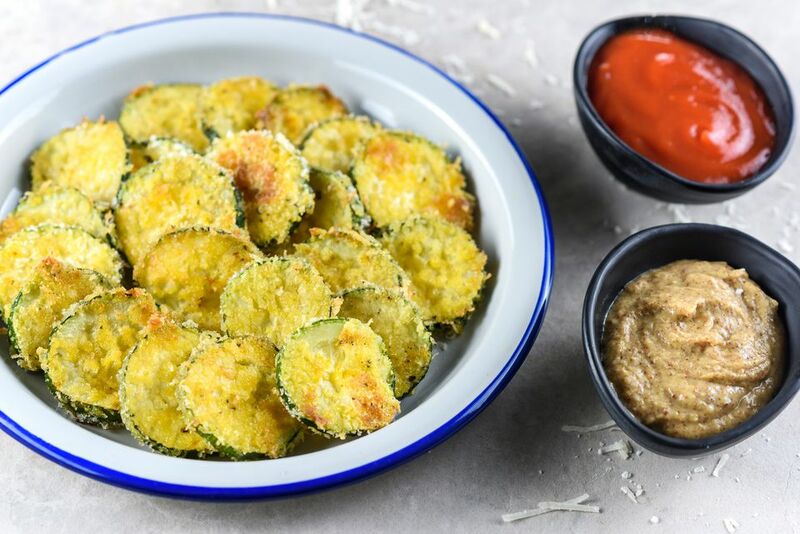 To improve the crispiness, instead of baking breaded zucchini directly on a baking sheet, arrange them on a wire rack that has been lightly coated with cooking spray and placed on a baking pan to catch any drips. Give the tops of the zucchini rounds a light mist of cooking spray. Bake as directed above.